How have you been? How life is treating you all?Are you doing something to protect yourself from this scorching heat? Summers are hitting hard .Do you agree with me? I am struggling these days to keep my home cool throughout the day and I am in decluttering mode.Somehow I think decluttering increases space and more space eventually leads to better air circulation so cooler spaces!! Am I going astray? Yeah...seems like.Huh!! 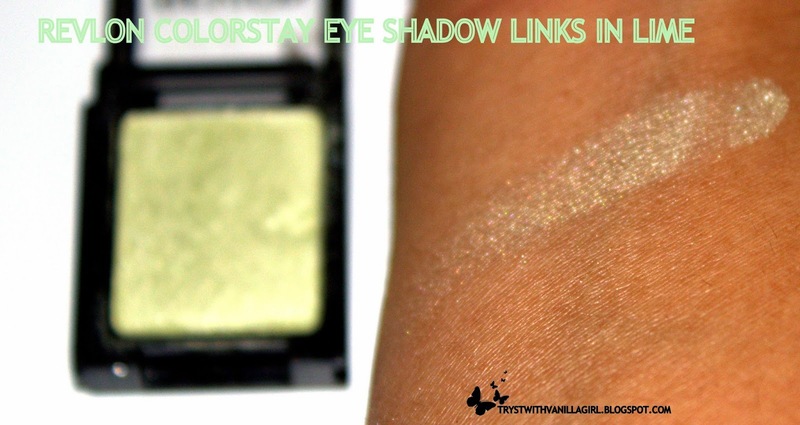 I am going to talk about Revlon's Colorstay Shadowlinks in this post. It was just a while ago when I saw Emily Noel talking about the shadow links.I liked the idea of customizing own palette but It never occurred to me that they will find their way so soon in Indian market also.They were not available in Chandigarh till 28th march and spotted them first in Gurgaon in a Mall (Name forgotten).I instagrammed when I was checking them out.Rest is history I ended up customizing my own palette with ONYX,PEACOCK AND LIME. Can be customized into a palette of your own choice!! Lime is light pista green which somehow comes as golden on my lids.It has very light shimmer. 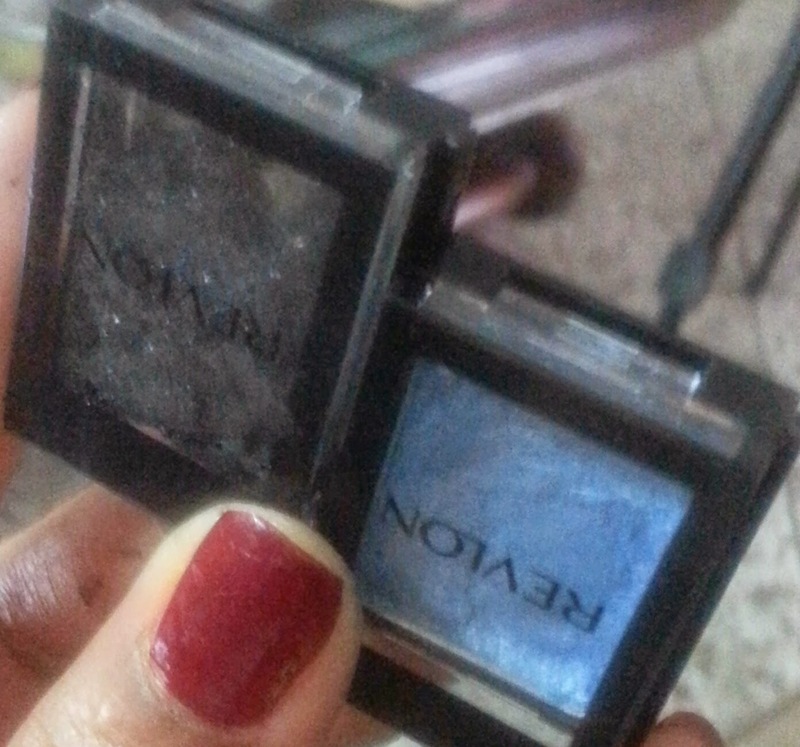 Peacock is peacock blue with the hint of Golden undertones and barely discernible golden shimmer. 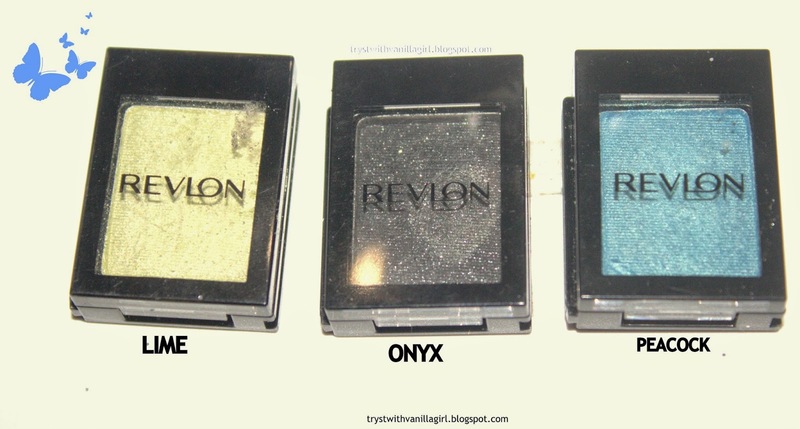 Onyx is black eye shadow with silver glitter. Lime has adequate pigmentation.On lids it somehow fails to show its original colour.I reapplied it many times on my lid to get a satisfied pigmentation. 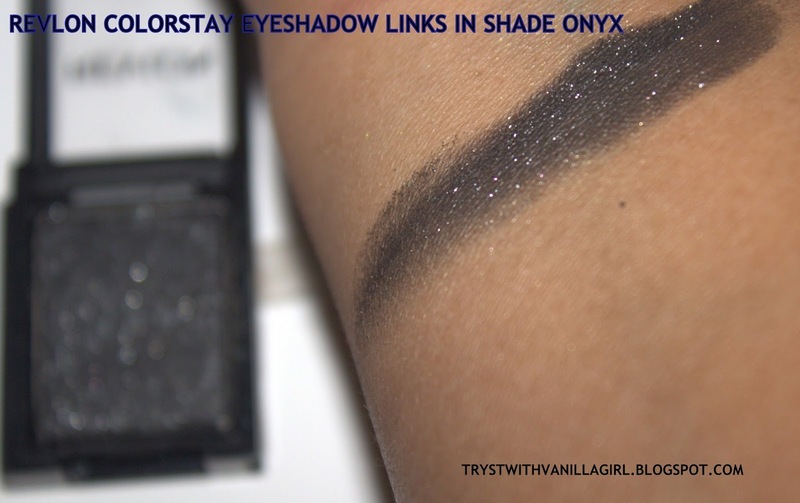 Onyx is deeply pigmented.One swipe gives a workable pay off. 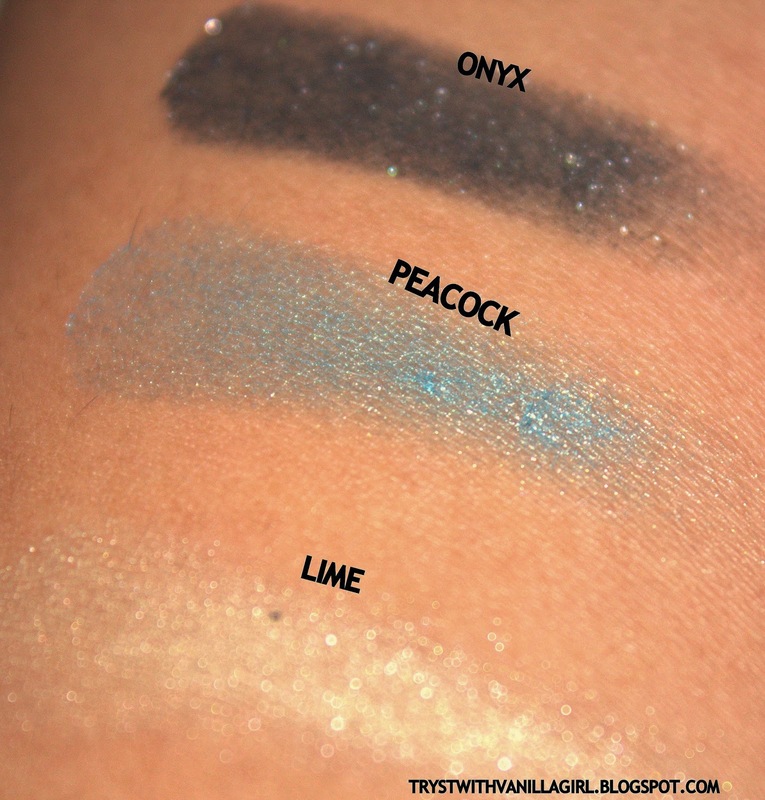 Lime has a very satiny finish when swatched.It has a veil of sheer iridescent goldenish particles . Peacock is again a satin finish with golden hue and Golden iridescence. Onyx is shimmer in finish.Its beautiful black with silver glitter. Lime Its a beautiful color.But a ghost golden under pista green.Its not limey at all. This is the area which I love most.I loved the idea of customizing your own palette.Different shadow links fit into each other tightly.Neutral ones can be carried as such.Its supersleek body makes it travel friendly. X FACTOR: 10/10 I loved the look I crested with them.It just brought that "X"zing to my face. Lime on smudging will make the colour disappear. Peacock again on smudging will vanish. Onyx stands the test of time.Its such a beautiful color that smudges beautifully adding dimension to the entire look. 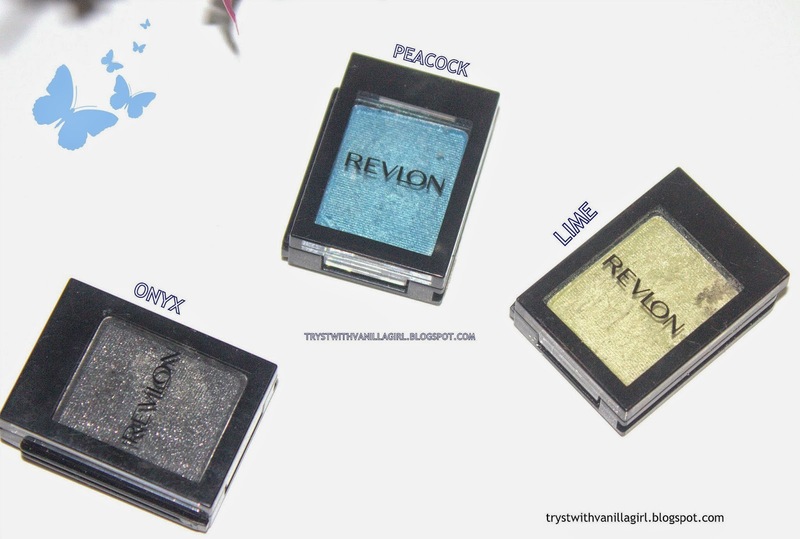 I highly recommend using a good primer before you toy with these eyeshadows. As two of them has less pigmentation and third one has good fall out. Use paper tissue or eyeshadow catchers in your undereye region. Go bonkers customizing your palette. Let your creative juices flow and invent your own palette. Let me know shades which you bought from this collection.I am looking forward for more inputs from all of you as I really liked eggplant and lilac!! 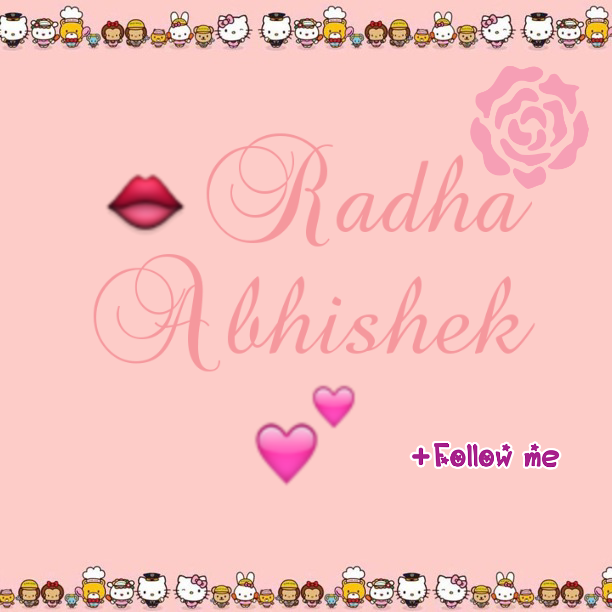 Watch me in action using these cuties on my youtube channel! !